Peacock hostel is located on the sea side close to Saladan ferry pier at Koh Lanta, Krabi. We’re very closed to the center and stay among local life of the people in Saladan village. If you looking for the cheap and clean stay with friendly art, please visit us here. Peacock hostel is the wooden local house style that located on the sea with water under, feeling like sleeping on the sea touching the natural. We have a fan dorm room 2 floor sleeping 8 guests 2 rooms connecting, the bedroom all painting like we are sleeping under the sea world and find more art painting in every toilet and bathroom. If you love an art, you will love here. We have small breakfast service you at the sea view terrace next to the bedroom. Our open air terrace 2 floor that nice for relaxing in your free day, some cute crab and fish will visit us under the house every day. We also stay at the good location, closed to the ferry pier that convenience to connect your next destination and far from the center just 200 meter for enjoy many local food, tour office and shopping. 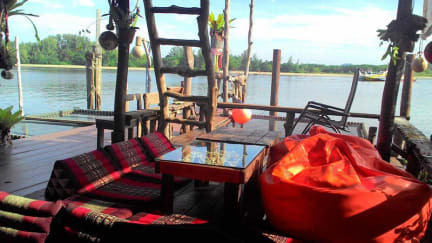 Enjoy your free time at the open air and sea view terrace, chill out on the net hammock over the sea that only here in Koh Lanta, Pls come enjoy the feeling of freedom with us here, the Peacock Hostel.